City clerk candidate Devon Reid speaks at the Democratic Party of Evanston’s endorsement meeting on Sunday. DPOE members voted to endorse Reid at the meeting. 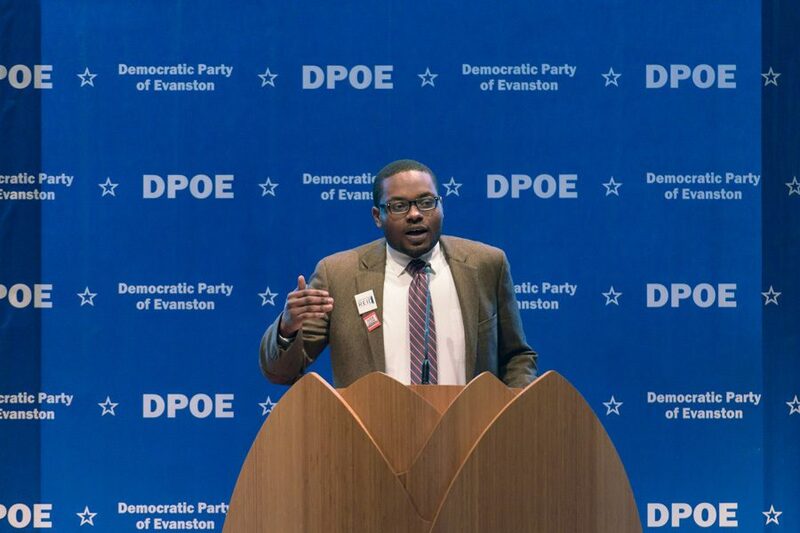 The Democratic Party of Evanston voted Sunday to endorse Devon Reid for city clerk and to support a referendum to increase property taxes to fund a deficit in Evanston/Skokie School District 65’s budget. More than 80 percent of the members in attendance voted in favor of the upcoming District 65 property tax referendum that will be placed on the April municipal ballot and would help the district combat a projected $114.4 million deficit by fiscal year 2025. Reid received 88 votes, which amounted to 75 percent of votes cast, while current City Clerk Rodney Greene received 15 votes. Fourteen members voted not to endorse in the race. Reid said he is “extremely excited” to receive the endorsement from DPOE and that he thinks voters want to have a more efficient and transparent city clerk’s office. He said he thinks DPOE members also want a city clerk who will “clean up” the election process and help increase turnout in elections. “I’m honored to be the only candidate who was able to walk out of there yesterday with their endorsement,” Reid said. More than 20 candidates for the numerous contested city positions gave brief speeches to more than 200 people in attendance at the DPOE endorsement meeting Sunday, held at the Unitarian Church of Evanston, 1330 Ridge Ave. Current members of DPOE could fill out forms at the meeting stating which candidate they think the organization should endorse in each contested race. There was also a “no endorsement” option for each race. If more than two-thirds of voting members agreed on an endorsement for a candidate or voted to not endorse, then DPOE would follow suit. DPOE will not endorse a candidate in the city’s mayoral race or any candidates in contested aldermanic races after its members voted on endorsements Sunday evening because no candidate did not receive the required number of votes. In the five-way mayoral race, Steve Hagerty received the most votes, with 38 members, or about 28 percent, voting for Hagerty. Ald. Brian Miller (9th) followed closely behind with 36 votes; Ald. Mark Tendam (6th) received 32 votes; Jeff Smith (Weinberg ‘77) received 17 votes and Gary Gaspard received two votes. Thirteen members voted to give no endorsement in the mayoral race. The only uncontested aldermanic positions in the upcoming election are the 2nd, 4th and 7th ward positions. No candidate in any of the contested aldermanic races received a two-thirds majority in the DPOE vote. The vote for the 1st Ward race between incumbent Ald. Judy Fiske and Lee Cabot was close, with Cabot receiving 41 votes and Fiske receiving 39 votes. In the 5th Ward voting contest between five candidates vying to replace Ald. Delores Holmes, Robin Rue Simmons received 56 votes, or about 60 percent. Misty Witenberg followed in second with 11 votes. Ald. Ann Rainey, who is running for re-election against Rob Bady in the 8th Ward race, received about 51 percent of the votes. Though it did not endorse any mayoral or aldermanic candidates, DPOE said on its website that it was pleased with the consensus among candidates in protecting Evanston’s values. “As a party, we were proud to see every candidate commit to stand up to Bruce Rauner and Donald Trump’s agendas and keep Evanston a Sanctuary City even if it means losing federal funding,” it said in a statement. Early voting for the Feb. 28 mayoral and 5th Ward aldermanic primaries continues now through Feb. 27. The general election for all races is April 4.